Based on the announcement of the Government's in April 2017, many changes have made to the employer-sponsored program. Some more changes were scheduled to take effect in January 2018 and also in March 2018. The applicable legislation has not taken place so far but, Immigration authorities have issued information in helping to understand these arrangements. There are changes to employer-sponsored occupations lists meant for Temporary and Permanent Skilled Visas to be introduced approximately by 17 January 2018. The proposed changes would not affect any open applications if they were submitted before the change took effect. Similar changes had significantly altered the temporary residents in 2017, and hence the present approach is welcomed. The 457 Visas will be replaced by TSS Visas starting from March this year. • Up to 4 years when the chosen profession listed on the Medium to Long-Term Strategic Skilled List. This methodology will continue when the TSS is introduced. In July 2017, Immigration authorities introduced the condition for 457 applicants for providing police clearance certificates for every country where the applicants resided for more than 12 months. This requirement will continue in the TSS Visa. In March 2018, Labour Marketing Testing will be mandatory for all TSS applications, in cases where international trade obligations are not applicable. Presently, LMT is appropriate in nominations related to nursing, trade, or engineering professions. LMT if introduced for all cases can delay the filing of TSS applications and impact severely on the ability of the Sponsor to fill up the vacant position urgently. Other details regarding streamlined initiatives to process all applications will be announced in February. In March 2018, changes planned for employer-sponsored permanent residence. The transitional arrangements, or provisions for grandfathering, for a few categories of 457 visa holders and also applicants listed on 18th April 2017, have not yet been finally approved. 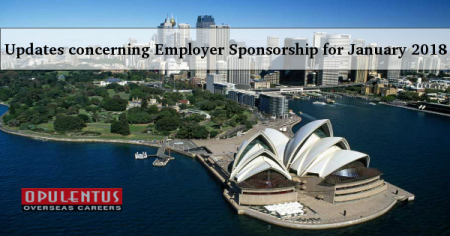 Presently, obtaining an employer-sponsored visa involves a complicated and slow process when compared to the past. Many changes are likely to be proposed, and information regarding the announcements, of Immigration is confusing. We assist the applicants and incorporate the latest guidelines issued in this matter. Please contact us for guidance. The application will be processed quickly.